Number Crunchers Anonymous, a forum for simpler adventures. Re: Chef's chuckwagon rides again! All four goblins look up from their tinkering. 3 of them leap into their mechs, shouting alarms. The fourth (at G-6) comes up short. Horror fills his eyes as he is ankle tackled and wrestled down by scrub brush. The three mechs form up , apparently planning to hold the ramshackle bridge to the wheel house. In the process one mech is entagled. This spell causes tall grass, weeds, and other plants to wrap around creatures in the area of effect or those that enter the area. Creatures that fail their save gain the entangled condition. Creatures that make their save can move as normal, but those that remain in the area must save again at the end of your turn. Creatures that move into the area must save immediately. Those that fail must end their movement and gain the entangled condition. Entangled creatures can attempt to break free as a move action, making a Strength or Escape Artist check. The DC for this check is equal to the DC of the spell. The entire area of effect is considered difficult terrain while the effect lasts. If the plants in the area are covered in thorns, those in the area take 1 point of damage each time they fail a save against the entangle or fail a check made to break free. Other effects, depending on the local plants, might be possible at GM discretion. Um, I think I already did. Post 48 (rob): "Okay, makes sense. Chef makes a double-move to behind the tree at M-3 or so, locating him inside the area of entanglement. Reflex save: 19 + 4 = 23"
If I'm reading the spell correctly, an ally must save to enter the area and not be entangled. That was Chef's reflex save. Tuq rides to X-6, which gives him a straight and clear LOS to H-6. Tuq casts Entanlge, centered on hex H-6. Entangle has a range of 480ft and an area of effect radius of 40ft, which covers 8 hexes in all directions. That covers all the way to the west side of the map, the top of the map, down through the Gin mill and to line O on the east side in grasping vines. If that is ok with GM, I will update map...."
So, I think Chef can move and act as normal, but then must save again at the end of his turn. What do ya think, DM? For sake of expediency, I'll take my turn, if that's alright. Not sure what Emil could do to impact Chef's action, anyways. I'm not even sure of Emil's location on the map... We can retcon if needed. Chef is furious. He sees red. He thinks: How dare these goblins attack the humble folk! Even the roots and twigs grasp at them in fury! The goblins will pay dearly for their mischief! Whoah, better step lively now! 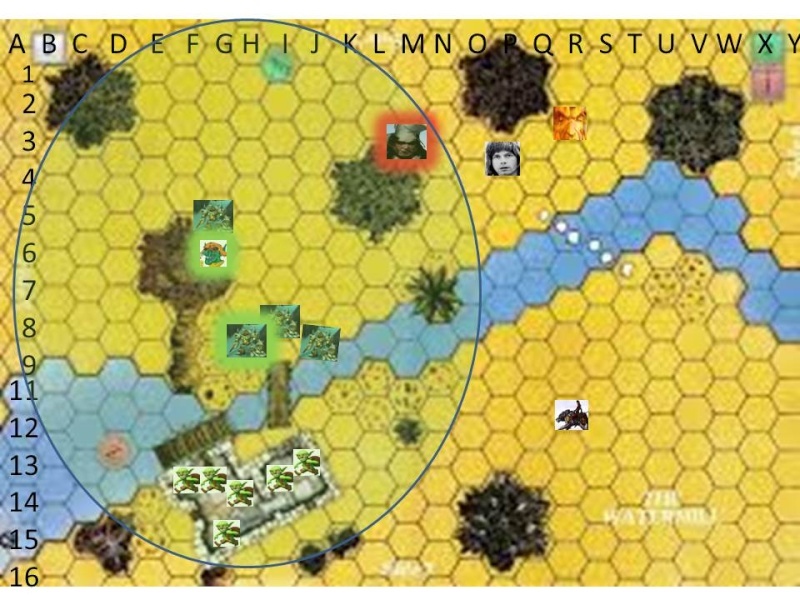 He moves over to the goblins at the tree (G-6) and swings his wicked curve blade. Fury (Su): A shaman incites a creature within 30 feet into a primal fury. The target receives a +2 morale bonus on attack rolls and a +2 resistance bonus on saving throws against fear for a number of rounds equal to the shaman's Wisdom modifier. The goblin's bright purple eyes grow wide at chef's approach, and then wink out to a dull charcoal as his blade severs its pulmonary artery. I am abou to embark on 8 crazy days in Florida. I can post once or twice a day. Please keep the initiative going without my cues and I will do what I can. navyik wrote: I am abou to embark on 8 crazy days in Florida. I can post once or twice a day. Please keep the initiative going without my cues and I will do what I can. ok, will do. Have fun! map updated - I don't think Emil has actually gone at all yet, so he hasn't been placed on the map yet. Put him next to nigel.... Er... Um... Korwin. I'm going to give Dan a chance to post over the weekend, besides that, the GMs driving to Florida right now. Yeah; no rush. We at airport now! Sorry guys, been a busy week as I prepare for a career change.. If Emil comes in the map around Y-1, he'll just spend round 1 moving in on the goblins. Just place him somewhere by Lumenor or Korwin. He'll ready his Rapier in one hand and his tambourine in the other. Lumenor moves to a position just outside of the entangle zone, adjacent to the creek. He throws a flask of oil at the clump of mechs around the bridge. Tuq's stone threads through the mech and biunces off the pilot's pauldron. The pilots, realizing their alarms are being drowned out by the mechanisms in the mill, begin to fan out. One charges Chef and hits with a blade for 6 damage. The next charges Lumenor with a claw, but misses. The third walks upstream to the bush where it is safer to cross. no worries, I forgot to move for a week too! just a reminder, all the goblin pilots\mech that remained in the AoE of Entangle (that is all of them) had to save again at the end of Tuq's turn (right before they moved). The pilot in the H column (green aura) was Entangled, so he can't move without a Strength check or an Escape check (move action) and wouldn't be able to attack, since he would have used his move action to attempt to break free, and thus couldn't move + attack. The others, if they passed their new saves at the end of Tuq's action, are still in "difficult terrain". They cannot charge and all movement costs double. If either of the remaining 2 failed, they also have to use their move actions to attempt to break free. Spell duration is 1min\level, so 20 rounds, 19 remaining. The first mech breaks free and moves toward Chef but does Not attack. He makes his end of move save also. The second gets entangled and spends the full round breaking free. Emilian grins as the Mechs begin to mobilize in the tangleyness that Tuq created.. He begins to nod his head and swing his hips to a tune that only he can hear.. he thumps his tambourine against his thigh rhythmically with his movements.. He is playing a tune he just wrote for this occasion, that he calls.. He hums along... "daaa daaa, da-da-daaa, da-da-da-da-da-da da da da..."
Inspire Courage (Su): A 1st-level bard can use his performance to inspire courage in his allies (including himself), bolstering them against fear and improving their combat abilities. To be affected, an ally must be able to perceive the bard's performance. An affected ally receives a +1 morale bonus on saving throws against charm and fear effects and a +1 competence bonus on attack and weapon damage rolls. At 5th level, and every six bard levels thereafter, this bonus increases by +1, to a maximum of +4 at 17th level. Inspire courage is a mind-affecting ability. Inspire courage can use audible or visual components. The bard must choose which component to use when starting his performance. Emil should be standing right by Korwin I think. Emil is done. Everyone's saves vs. charm should be buffed, and +1 to attack/damage. Top of the round, chef is up. Hearing the sounds of the tambourine, Chef concentrates and hacks at the goblin at G-5. *Chef should be making saves at the end of Tuq's turn? Oh well. **Edited to incorporate Emil's buff. Chef's blade slices through armor, machinery, flesh and bone... Then more flesh and then air, filling the air with misty mixture of goblin blood and machine oil. The whole kit and caboddle collapses; it seems to implode on the lifeless pilot like compacted trash. navyik wrote: Chef's blade slices through armor, machinery, flesh and bone... Then more flesh and then air, filling the air with misty mixture of goblin blood and machine oil. The whole kit and caboddle collapses; it seems to implode on the lifeless pilot like compacted trash. Lumenor apears to reach into the lantern he carries, and scoops out a handful of flame, which he then hurls into the oil-soaked tangle of brush around the mech's feet. Sorry, work has been crazy. The mechs near the bridge are in flames. The one that moved to the bush is not. Lumenor's eyes are rivited to the flames. Everyone else sees occassional goblin faces peeking out various windows of the mill as it sprawls wildly up the cliff face in a discheveled patchwork of add-ons and kitbashed repairs. These goblins don't seem interested in the battle. Only tuq sees a terrified little girl peeking out at the top on tippie-toes. since I have no idea what to do... Korwin will just continue to charge at the house. I assume there's some sort of damned save for the Entangle? Tuq calls out and points to the little girl, "There, in the window! That little girl must be Wella, the missing child." Tuq's stone bounces off the mech. That mech carefully crosses the creek. 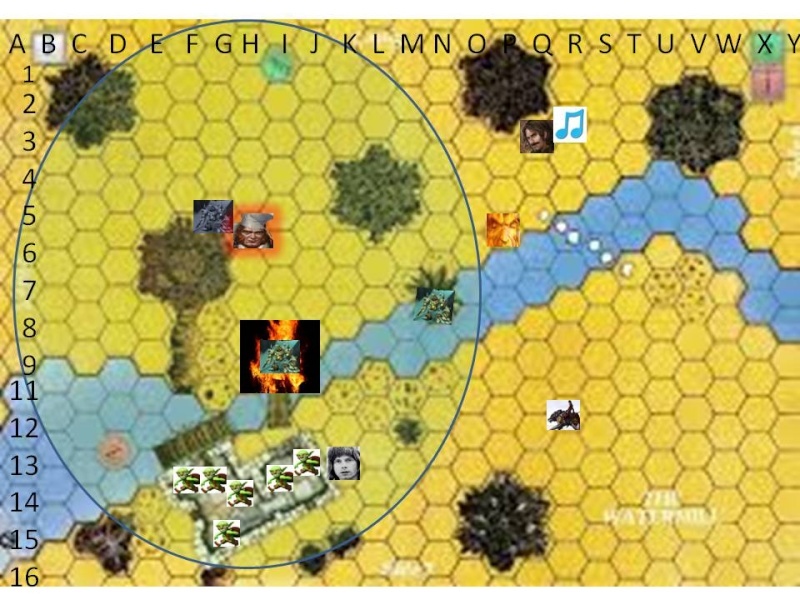 In an effort to both fall back, and dodge flames, one of the pilots stumles across the narrow plank bridge, which isn't strong enough. One crashes into the mill, right through the door, spreading flames inside. The second falls headlong into the creek. No offense, but maybe we should reinstate the "go 3 days without response: lose your turn" rule. Things have slowed way down. Still having fun though. I understand the map is current. What is the status of the token next to Chef? Pilot at G5 is dead. One is drowning, one is in the mill on fire, one has crossed the river to get Tuq. Emil is corrious about the mill. He approaches the river with a double move. Still furious (last round) from Lumenor's enchantment and courageously inspired by Emil's tune, Chef makes a double-move. He runs towards the mill, and with great gusto, leaps across the water and and grabs onto the old creaky water wheel. Chef is holding on as best he can. If he has any movement left, Chef is climbing up the wheel. He wants to make his way towards the window where the little girl was seen by Tuq. While chef can jump up onto the watrwheel, the climb would be about 6 or 7 stories to the window. Water splashes over Chef and he coughs. He is making his way towards the window of the little girl.